What is a good patent? What is good support for good claims? 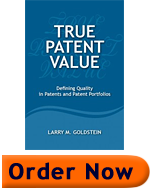 What are external events that destroy patent value? What is a good patent portfolio? The Appendix is the patent US 5,133,079, discussed in Chapter 5. You may review US 5,133,079 to understand the specific sections of a patent, and how a patent is structured. Q13: What is a VSD Evaluation? This is a way of evaluating the quality of claims in a patent. “VSD” is an acronym for “Validity, Scope of coverage, and Discoverability of infringement”. Scores for each of V, S, and D, are typically the end result of an expert fundamental analysis (“EFA”), which is analysis of value by a human patent evaluator. In performing a VSD analysis, remember that Validity and Scope are natural enemies. A patent with claims of extremely broad scope might seem to be a great patent, but unfortunately claims of such scope are often subject in litigation to challenges of invalidity. Correspondingly, patent claims can be written so narrowly that they are almost certainly valid, but in the end they may be subject to the “ninety percent rule of patent prosecution” that makes the claims virtually worthless for the purpose of finding and prosecuting infringement. Q14: What is the ninety percent rule of patent prosecution? This is a rule that says that it is possible to obtain a patent claim in 90% or so of prosecutions, but the resulting claim may be so narrowed by amendments or other limitations as to be useless for purposes of proving any infringement. Such a claim will probably be allowed, but it will have very narrow scope, because (1) probably no one infringes or will infringe the claim, (2) if they did infringe, you wouldn’t know it, and (3) even if you did discover an infringement, the infringer would very likely be able to design around the infringement. Method claim #48 in US 5,414,796, lesson 7-3-2 (Individual), is a possible example of a claim subject to this rule. It is instructive because its parallel claim, method claim #1, has a much greater scope than claim #48. SUMMARY OF Glossary: Approximately 80 terms used in this book are listed and defined. The Glossary should be read with Chapter 8. Patent Thicket: A group of patents working together to protect various aspects of the same general invention. Generally owned and administered by one company, but may also be administered (and not owned) by a single entity such as a patent pool administrator, an NPE, or a DPA. Patent pools, NPE aggregations, and DPA aggregations, are generally not thought of in the industry as “patent thickets”, but in reality that is what they are. See “Aggregator”, “Defensive Patent Aggregator”, “Non-Practicing Entity”, and “Patent Pool”. Vertical Claim Confusion: This is the result when a single concept appears as different terms in different elements of the same claim. It is a type of shifting terminology that occurs entirely within a single claim. This kind of shift does not appear often in patents, but when it does appear, the resulting confusion is often catastrophic. If a court or the ITC cannot understand what the claim says, which is very possible, the likely result is that both the confused claim and all claims dependent on the confused claim will be invalidated. (This claim confusion is called “vertical” because when a claim is presented on either a screen or a page, it is generally presented such that the reader scans down from one claim element to the next. This vertical scan reveals the confusion, and hence the confusion is “vertical”.) See “Shifting Terminology”. Compare “Horizontal Claim Confusion”.